Julian Assange, the founder of the controversial publisher WikiLeaks, was arrested in the Ecuadorian embassy in London Thursday morning after the South American country revoked the political asylum that had protected him for nearly seven years. 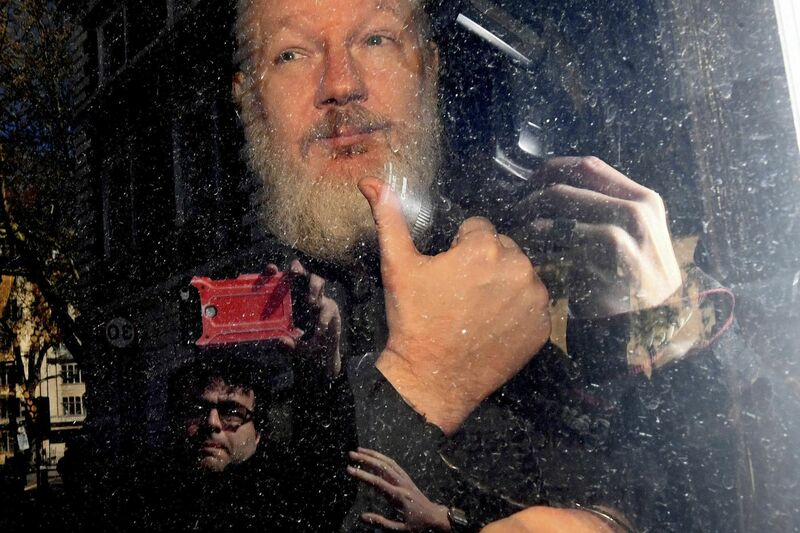 A bearded Assange was seen briefly before being placed in a van by Metropolitan Police, who said he was arrested “on behalf of the United States” under an extradition warrant. Video of his arrest was captured by a media outlet called Ruptly, which told CNN it had been recording events outside the embassy 24 hours a day since at least April 5. The Department of Justice confirmed Assange had been indicted on charges he conspired with former Army intelligence analyst Chelsea Manning to access Department of Defense computer systems in March 2010. The indictment was signed in March 2018 and unsealed Wednesday in federal court in Virginia. Read the full unsealed indictment here. A judge in London’s Westminster Magistrates’ Court found Assange guilty of breaking his bail conditions when he entered the Ecuadorian embassy in 2012. Judge Michael Snow called Assange a “narcissist who cannot get beyond his own selfish interest” and remanded him into police custody until a May 2 extradition hearing. Assange faces up to 12 months in prison for the conviction. Assange, 47, is an Australian-born computer programmer and activist who at the age of 20 hacked into the master terminal of Nortel, a multinational telecommunications company. Assange founded WikiLeaks in 2006, and based the platform’s computer servers in Sweden, which has broad protections for whistleblowers. Over the years Assange has used the platform to share a slew of documents, including internal documents from the Church of Scientology and emails from the Yahoo! account of former Alaska governor Sarah Palin. WikiLeaks is a controversial web outlet that has positioned itself as a whistleblowing platform, often publishing classified documents and controversial material. WikiLeaks has published millions of documents over the past 13 years, but rose to prominence when it began disseminating documents provided by Manning, which included a classified video of a 2007 attack in Iraq of American soldiers in a helicopter killing a dozen people in Baghdad, including two Reuters journalists. What is Assange accused of? Assange is accused of conspiring with Manning to publish secret military and diplomatic documents on Wikileaks in 2010. Manning was imprisoned for seven years for violating the Espionage Act (her sentence was commuted in 2017 by former President Barack Obama), but has been in jail since March 8 for her refusal to testify against Assange before a grand jury in Virginia. What are reporters and press freedom advocates saying? The NUJ is shocked and concerned by the actions of the authorities today in relation to Julian Assange. His lawyer has confirmed he has been arrested not just for breach of bail conditions but also in relation to a US extradition request. The UK should not be acting on behalf of the Trump administration in this case. The NUJ recognises the inherent link between and importance of leaked confidential documents and journalism reporting in the public interest. It should be remembered that in April 2010 WikiLeaks released Collateral Murder, a video showing a 2007 US Apache helicopter attack upon individuals in Baghdad, more than 23 people were killed including two Reuters journalists. The manner in which Assange is treated will be of great significance to the practice of journalism. Why has Assange been in asylum? Former Ecuadorian President Rafael Correa granted Assange asylum in 2012 when Sweden sought his extradition to face questioning over allegations of sexual assault. Sweden dropped the investigation in May 2017. Ecuador said it rescinded Assange’s asylum because of his “discourteous and aggressive behavior” and for violating the terms of his asylum. Among other actions, Ecuador’s Interior Minister María Paula Romo accused Assange of “putting feces on the embassy walls” during Correa’s government.